This gold gift box with clear lid and decorative gold cord makes the perfect gift for those who love art, mosaics, or art glass. The box contains ten beautiful cards with envelopes. You can choose all of one image or an assortment. The inside of each card is blank. An added benefit is that the image on each card can later be framed using a standard 5 x 7 frame if desired. The price of $24.50 includes shipping and handling inside the U.S. 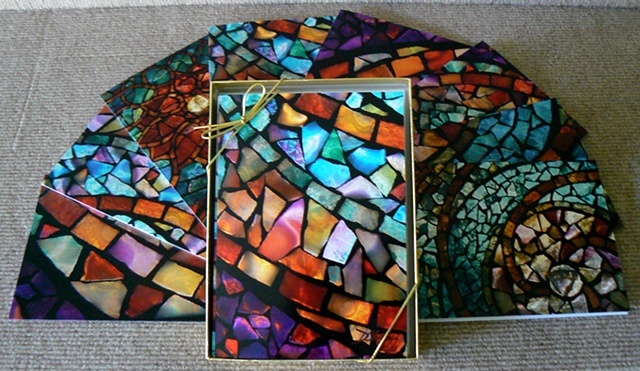 If you would like to purchase, send me a message here on my website or email me at artglassmosaics@aol.com so I can send you a PayPal invoice. Thank you.